Vivian Austin was born Vivian Coe on February 23, 1920 in Hollywood, California. A former Miss Hollywood and a dancer, this Universal contract starlet of the 1940s entered films as a Goldwyn Girl in “The Goldwyn Follies” (1938). That and a few other chorus girl assignments led to the contract with Universal, which cast her opposite Donald Barry in the original Red Ryder serial, “The Adventures of Red Ryder” (1940). 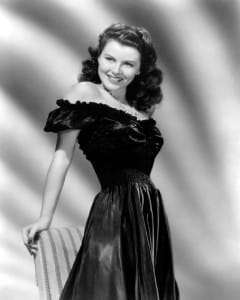 For unknown reasons, the studio then changed her name to Vivian Austin and as such she appeared in B-musicals with Donald O’Connor and Peggy Ryan, a couple of oaters with Rod Cameron, and the well-received comedy “The Men in Her Diary” (1944). She made 25 westerns, musicals and dramas for the studio until she nearly died from kidney failure in 1948, which leading to blindness, forced Ms. Austin into early retirement from the motion picture business. A Palm Springs, California physician, Dr. Kenneth Grow, managed to restore her sight, and later they married on December 30, 1968. Vivian Austin died of natural causes on August 1, 2004 (Aged 84) in Los Angeles, California.